We have so many choices when it comes to sneakers, it makes it hard to narrow it down and pick the best choice possible. Depending on your type of foot and stride we should all be wearing something for our specific needs. As I have mentioned in previous posts I am easily prone to blisters, specially on one foot where I always have a bruised toe. I have tried many different sneakers ranging in flexibility and cushioning which are the two main components I look for in running shoes. With all these new minimalists shoes makes me wonder just what is the best. Asics has been a brand to never let me down no matter what style of shoe I pick. New balance were my first running shoes and were great but a bit too heavy. Nike shoes are further down the list but are light, flexible shoes. Today I wear Saucony’s ProGrid Kinvara. So far, so good. 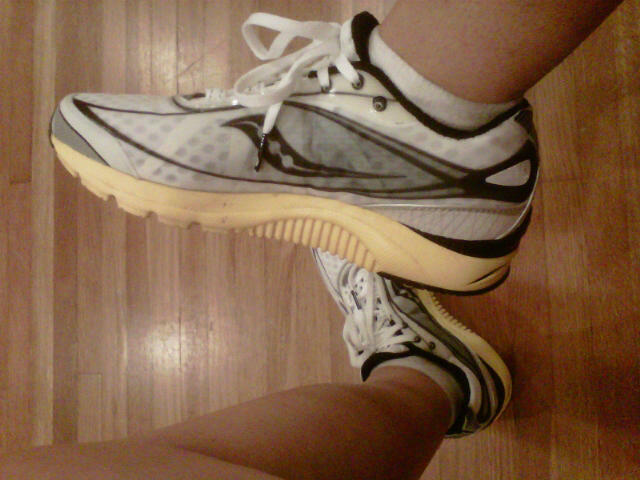 This is a neutral running shoe that is lightweight and flexible but has the midsole support I need. This weekend I will be running 17 miles for the first time and I hope my shoes give me no problems. Running all these miles makes my shoes wear out in about four months. I will continue to read articles about shoes and keep trying new ones as with everything else technology in running shoes in always upgrading. I have been having a lot of success with Newton brand shoes. Very light, designed to keep you off your heals. After wearing the Newtons for a while I tried my old Asics and felt like the Asics were made of stone. However, if you suffer from Achilles tendon or forefoot problems, you may want to avoid the Newtons. I have felt a tightening in both those regions since switching (although nothing worrying), and the Internet is full of warnings about people with weak feet and calves switching to these kinds of shoes without easing into it.